Last week I shared how we can fight the spiritual battle for our kids’ hearts and minds on our knees. 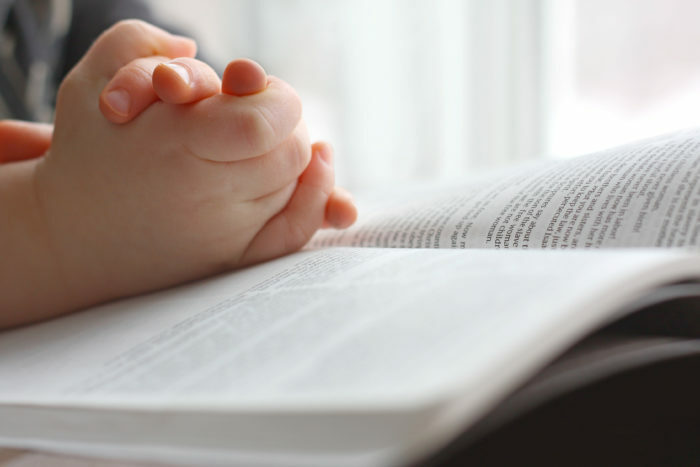 While interceding on their behalf is one of the best ways we can parent, it’s essential that we also lead our children to have their own thriving prayer life. Like with any spiritual discipline, prayer is important to build into their lives so it becomes a regular routine in their daily Christian walk. It’s crucial to establish this regular routine of prayer while their understanding, habits, and identity are still being formed. If our kids know they can communicate directly with the God that hears and answers prayers, it will help ground them in faith! And having a prayer lifestyle teaches your children to seek the Lord to know Him better, not just to get requests answered. Ideally, prayer should become like second nature for them. Of course, most of us are already in the practice of praying together as families before meals and bedtime. But how do we teach our kids to establish this habit for themselves practically? Connect the power of prayer to their struggles. As your children’s mom, you can probably zero in on their particular behavioral issues or weaknesses. You know, the same ones you’ve been addressing over and over? The next time you see this issue come to the surface, stop in your tracks and lead that child in prayer. If your child is struggling to control his emotions, prompt him to tell God his feelings (he may need help identifying them first). Then have him pray for help being patient, self-controlled, etc. Instead of asking your child to “speak kindly” for the hundredth time, take her aside so she can ask God to forgive her for a selfish attitude and pray for a soft heart. When my son begins to struggle with discouragement and speaks negatively about himself, I immediately have him stop right where he is and pray something like, “God, I am believing the enemy’s lies about myself. Please replace them with your truth.” It is training him to take every thought captive (2 Corinthians 10:5). When we have our children pray about their sins and struggles, it communicates that they don’t have the strength or ability to change themselves, but God does! Bring God into your children’s conflicts with one another. 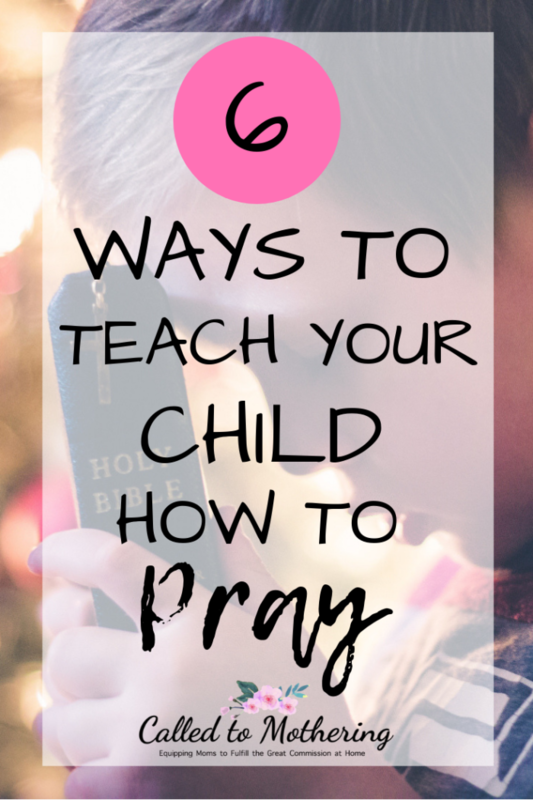 It can be so tiring having to play referee when siblings argue, but these arguments are actually a perfect opportunity to teach your kids how to pray. If (sorry, when) you overhear your kids fighting, encourage each one to ask forgiveness from God, confessing their anger, resentment, and hurt. Invite each child to then seek forgiveness from the sibling they offended. And finally, ask your children to pray for one another. It’s difficult to stay mad at someone you’re praying for! Developing a habit of talking to God about their feelings and keeping short accounts will pay out great dividends over the course of their lives. Have them start a prayer journal. One of the most tangible ways for your kids to grasp the power of prayer is to see that God actually does hear and answer their prayers. A journal is a great way for them to keep track of what they’re praying for and how God answered those requests. These recorded answers will become a testimony of His faithfulness and power in their lives. As they get in the habit of writing down their prayers, they will be prompted to come up with ideas for even more. Sometimes children get stuck knowing what to pray for at meals and bedtime, so get a little creative. Ask your kids to brainstorm several ideas and write them on popsicle sticks or strips of paper. Keep these in a container or jar labeled “prayer” that they can decorate, and then have each of them pull one out at designated prayer times. Trace their hands on construction paper and write a special prayer request for that particular child on each one. They can alternate praying for the “left hand” and the “right hand” throughout the week. At the end of seven days, have them exchange the hands and pray for one another. Then, start the process all over again the following week. When the month is over, connect the hands together to make a prayer chain! Incorporate prayer for different people around the world. One of our favorite subjects in our homeschool is geography. As we’ve explored various cultures and people groups all across the globe, we have also prayed for them. You can pick a different place to study together as a family each month. Have your children draw pictures of what they learned and hang them up in prominent places to remind them to pray for the people of that region. Kids Of Courage has a list of countries with printable, illustrated packets full of information and activities for each one, plus suggestions of what to pray for based on that country’s needs. You can also mix things up by playing games that will test their knowledge of geography and make prayer fun. Get one of those inflatable globes to toss around with your kiddos. Whoever catches it has to pick a country, locate it on the earth, and then pray for the people living there. Model it in front of them. It starts with us, moms. If we’re not intentionally praying for others or engaged in an active prayer life, it’s not likely our children will. Let them hear you pray out loud for your spouse, friends, and neighbors. Let them hear you pray about that thing you’re struggling with and what you learned in the Bible. Most of all, let them hear you praying for them. Share answers to personal prayer during your conversations and thank God together for His provision, protection, and mercy. The best way for children to see and desire an intimate relationship with Christ is by observing their parents’ prayer life. You can influence and impact your kids for eternity by kneeling with them and showing by example that you trust God with your concerns! Thank you for this post! It’s added so much to my toolkit in this area. I especially love the handprint idea! Love the idea of having a prayer journal for the kids. My hope for my boys is that they will become prayer warriors. This is such a fantastic article! I appreciate how your posts are always so focused on the Gospel! Thank you so much for the reminder that without staying in His word raising our children is so much more complicated. As our children get older we forget these things and you reminded me that God first no matter what! Attitudes, anger etc He can handle it all! I need to do this more. I usually ask them to ask the Holy Spirit for His help but don’t emphasize that we are desperate for that help because we can’t do it ourselves. We’ve always just modeled the folding of hands and closing of eyes, but didn’t worry too much at that age if our kids didn’t follow along. If they were learning to talk to God on their own, that was good enough! Eventually they caught on and have made this their own practice.